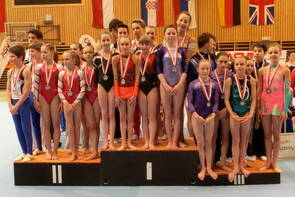 The ASVÖ-Youth-Tournament is an unique gymnasticsevent in Europe. Children and Juniors from eleven to sixteen can participate at the competition, either in men's artistic gymnastics (MAG), in women's artistic gymnastics (WAG) or in rhythmic gymnastics (RG). Since 1998 the competition is held in memory of the former coach Attlia Pinter, who died in 1997. The ASVÖ-Youth-Tournament traditionally takes place in Innsbruck, the capital of Tyrol, at the beginning of the new gymnastics season during springtime. Our tournament is such a specially event because it includes a team result, which combines scores from men's and women's gymnastics as well as the rhythmic gymnastics performances.In addition to the coveted team title there will also be individuell results in each sports and age category. The ASVÖ-Youth-Cup is an annual event, which is organized by the Tyrolian Gymnastics Federation with support from ASVÖ Tirol. Traditionally up to 20 teams from more than ten nations participate at the tournament the ledgendary ORF-link-man Harry Prünster accompanies the audience through an exciting competition time. For sure, there are no entrance fees!